Bots, spammers, and fake accounts have been an ongoing problem when it comes to social media, and no wonder! The rise of social media’s power gave millions of people the opportunity to create fake accounts and do spamming activities. Before the rise of social media networks, spam was mainly done via email. Nowadays, however, social media networks are spammer’s main target. In fact, the more popular the network the more it is vulnerable to spam, bots, and fake accounts, and Twitter is no exception. As social media networks evolve, they constantly introduce new updates in order to combat this problem. It is not an easily solvable problem and everyone is aware of that, but new updates when it comes to the rules of engagement definitely help. Almost all major social media networks, including Twitter, have had new updates regarding spam, bots, and fake accounts in the past year. This being said, social media managers should always keep track with the newest updates regarding social media platforms’ rules of engagement, terms of service, as well as algorithm changes. Due to Twitter’s newest updates when it comes to the rules of engagement many social media managers are not fully aware of the impact these updates have on their Twitter accounts. Therefore, we’ll explain in-depth what the updates are and how they’ll impact your Twitter accounts. But first, let’s go over the reason behind these new updates. Twitter’s spam rules are not a new thing. In fact, in the Twitter Rules you’ll find a whole section relating to spam and security, but more on that later. What we want to inform you about now is why Twitter decided to update their rules on spam on February 2018, so let’s explain the reason behind this. In short, the obvious explanation for updating their rules when it comes to spam would be, well, the ongoing growth of spam. Twitter has been drowning in spam over the past couple of years, and this problem was only growing day by day. That is why before introducing the new updates in their rules, Twitter made some changes in their Terms of Service (TOS). These changes are some of the spam-prevention methods Twitter came up with, some of which are overlapping with their newest updates, so let’s give you a reminder of what not to do according to the latest TOS changes. Post the same content across multiple accounts. This means that if you have more than one Twitter account, you’re not anymore allowed to post the same content on all of them. Instead, you should create and post original content across your multiple accounts since, if you don’t, your account (s) will most probably get suspended. Do simultaneous actions across multiple accounts. Similarly to the previous change, Twitter doesn’t allow its users anymore to retweet, like, or follow an account simultaneously across multiple accounts. Therefore, as a social media manager, make sure that if you have multiple accounts, the actions like retweeting or liking content, or even following accounts, are not done simultaneously across all of your accounts. Be mindful when it comes to this and don’t risk getting your account (s) suspended. Recycle identical tweets on one or more than one account. The last change in Twitter’s TOS is not allowing their users to continue to recycle the same tweets. This does not apply to only one account, but multiple accounts as well. While recycling evergreen content helps when it comes to increasing your reach, this is now a thing of the past since if you continue doing this you increase the chance of getting your account (s) suspended, so be careful. However, changing their TOS was not enough. In fact, only one day before introducing the new updates in their rules, Twitter has locked-out thousands of people from their accounts, suspecting they were bots. In order to unlock their accounts and resume their activity, they were asked to share their phone numbers so Twitter could confirm these accounts were belonging to real authentic people instead of bots. This angered many users, so Twitter decided to update their rules in order to stop something like this from happening again. What are the rules and what do they mean for social media managers? Continue reading to find out. On February 21st 2018, Twitter announced four new updates in their rules which went into effect on March 23rd. Let’s go over each of them, explain what the changes are all about, and how that will affect you as a social media manager. Similarly to one of the recent TOS changes we mentioned earlier, Twitter users are no more allowed to post the same content across multiple accounts. What’s more, this new rule does not only apply to identical content, but substantially similar content as well. This means that even if you change a couple of words in your tweet, for example, those two tweets will still be considered to be the same content. What Does This Mean for Social Media Managers? Apart from not being allowed to post identical or similar tweets to multiple accounts, you should also not have two or more similar Twitter accounts. This rule applies if you post the tweets manually but also if you use automation tools. If you are managing blogger’s account (s), you should bear in mind that the same content, or tweets, cannot be posted both on their personal and blog’s account (s). However, this doesn’t apply to retweeting that content. This means that if you want the same content to be on both accounts, you should simply retweet the post and not risk getting those accounts suspended. If you are managing a business, most brands have more than one Twitter account. In this case, retweeting is also an option, but in case you don’t want to do that, simply create a different tweet or post with the same context. Beware not to only change one or two words from the tweet since those two tweets will still be considered the same. Another violation of Twitter’s new rules is posting multiple identical, even similar tweets (including replies and mentions) “over multiple hours or days” via scheduling or automation. This rule applies if you post either on one or multiple accounts. It’s very similar to the previous rule, but this one emphasizes scheduling and using automation tools. We are not yet sure if this rule includes scheduling identical or similar posts after a month r two have passed since the original publication. However, just to be on the safe side, try to avoid doing this as well. What Does This Mean for Social Media Managers? Until recently, recycling evergreen content and tweets was considered to be great for increasing the reach on one’s account. As a social media manager, you might have encouraged this kind of action since it only did good when it came to increasing both reach and engagement. The only way in which this was not ok was if you posted identical or similar content in excess since this kind of action is considered spammy. However, this will now be a thing of the past. Include call-to-action in your posts. To conclude, don’t recycle the same or even similar content to increase your reach and engagement. If you think some tweet or post is worth to post more than once, at least wait for a couple of months so that you don’t risk suspension. If you want to post it the same weeks, make sure you change it enough so that it’s not considered similar to the original one. Another new rule that Twitter introduced in February 2018 is that Twitter users are no longer allowed to post multiple tweets to a trending topic. What does this mean exactly? That if there’s a certain trending topic that you want to use for promoting your brand, product, service, and so on, you’re not allowed anymore to post multiple tweets by using the trending hashtag. But wait, there’s more. Not only are you not allowed to post multiple tweets with the same trending hashtag, but you’re also not allowed to persistently use a hashtag of your own creation by incorporating it in your tweets. This rules exists so that both individuals and businesses could not manipulate a hashtag into becoming trending. Artificially creating a trending topic by persistently using a hashtag from either one or multiple accounts is now considered against the Twitter rules, so it’s important to keep this in mind. What Does This Mean for Social Media Managers? If you manage a business and want to dominate a certain trending topic, make sure that you really understand what this new update is really about. Let’s say that the trending topic is #fashiontrends and you want to promote a specific piece of clothing by using the hashtag. Well, if you post many tweets to promote your brand or some product or service that the business you manage offers, from now on that will be considered spammy so make sure not to do this. This goes both for single and multiple accounts. Also, if you want to create a trending topic, don’t tweet relentlessly by using that original hashtag. From now on this will be seen as artificially creating a trending topic and by doing it you’ll risk getting the account (s) you manage suspended. Interactive actions like liking a post, retweeting it, or following different accounts cannot be done simultaneously any longer. This is the fourth and last Twitter update in their rules, so let’s explain it more in depth. Simultaneously performing these actions can only be done through automation tools. Automating such actions gave many people more time for other things since manually liking and retweeting tweets can be time consuming. However, this is now a thing of the past, meaning that you would have to do these type of actions manually from now on. What Does This Mean for Social Media Managers? To put it simply, from now on you’ll have to do the above-mentioned actions manually meaning you cannot rely to automation tools to do this job for you. As a social media manager this can be time consuming, we’re aware of that since automation tools make managing social media accounts a much easier task, but you’ll have to forget about them in this case in order not to risk suspension. Social media managers everywhere, unite and ask for higher pay! We’re just kidding, but the truths is that after implementing these new updates in Twitter’s rules, social media manages can no longer rely on automation tools for things like scheduling multiple similar or identical tweets over one or multiple accounts, as well as performing actions such as liking, retweeting, or following different accounts through automation. So, if you manage multiple similar accounts, tweeting and performing other actions should mostly be done manually. This means that your load of work has just increased so you should manage your time more wisely from now on. Lastly but most importantly in this case, Twitter suspending your account (s) permanently. Therefore, make sure that you completely and entirely read and understand the meaning of the new rules so that you keep the account (s) you manage from being suspended. Social media managers, don’t despair since introducing these new updates and rules has a positive side as well. What might that be, you wonder? While the new Twitter rules mean less automation, they also mean less low-quality content. For one thing this will significantly decrease the number of fake profiles, spammers, and bots. There will no longer be repetitive content that comes off as spammy with automation tools doing the “dirty work”. This kind of content floods users’ Twitter feeds and this makes it almost impossible to come across quality content. In time, all Twitter accounts will have to produce quality content to their users, meaning that those fake accounts and bots will become a thing of the past. You may not be aware of this fact, but nowadays up to 15% of Twitter’s accounts are fake profiles meaning there are almost 50 million fake Twitter users that use these accounts for different goals. Some may use them to spread fake news, others to promote their business; the reason is not so important to Twitter. What’s important to them is to solve this problem and create a better Twitter user experience. Ok, there are new Twitter rules that restrict you to do some things that you’ve done in the past. So, now what? Don’t worry, since the new rules mostly mean less automation and more manual work. However, there are some things that you could do so that you don’t risk getting your accounts suspended. As we said, posting multiple identical or even similar tweets on one or multiple accounts is no more, according to Twitter’s latest updates. However, there’s one thing you could do if you manage multiple accounts and want to post the same content, and that’s to retweet it. Retweeting is not forbidden if you do it directly yourself on a few accounts you manage. What is forbidden, however, is if you simultaneously retweet on more than one account. This can be done only by using automation tools, so don’t use automation tools anymore for this purpose. Instead, you yourself should manually retweet from each account that you manage. This makes retweeting a good alternative to posting the same content on multiple accounts, just be careful not to overdo it. Since you can no longer post identical or similar content, you’ll need to start curating quality content in order to fill your timeline with relevant and interesting content. First things first, you must really know your audience before curating content if you want it to be successful. What demographics do your followers belong to? What about the psychographics? What are their likes and dislikes? What are their needs and interests? What problems do they have that need solving? These questions are extremely important if you want to successfully curate content, provide value to your audience, and give your followers not only what they want, but also what they need. Once you really know your audience, you’ll be able to decide on topics that will be of interest to them. After deciding on one or more topics, you can then search for content relating to those topics. If you have a clearly defined topic, it will be much easier for you to look for content. Check out different blogs as well as influencers in order to find those articles or posts that will be most suitable for your followers. Remember, curating content is far away from stealing content since you always incorporate the original link of where the content was found, but also make sure to add something original and recognizable to your brand. It’s also important that you don’t overdo this. Choose only content of high-quality with valid information from trustworthy sources. Curating quality content may also improve your search engine ranking. What’s also going to improve your search engine rankings is if you curate from different and various sources instead of one or two sources all the time. This will give you more credibility on Google and other search engines which in time will improve your rankings. 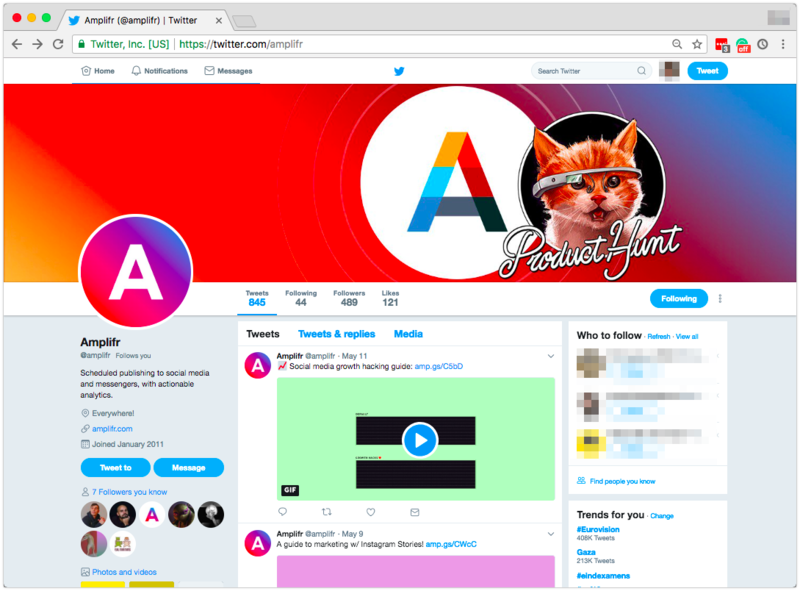 Automation may no longer be allowed when liking, retweeting, or following, but you can use it in this case. If you want to make this job easier for you, you can always use content curation tools. These tools’ purpose is to find you the content you need, and save it for future posting. They will categorize the acquired content and keep it for when you want to post it. In order to successfully build your community on Twitter, the first thing you need to do is create a clearly defined plan and strategy. Your actions need to be clear and concise, with a goal in mind of what you want to accomplish. Knowing your audience and creating quality content is of utmost importance also, so be relatable to your followers and deliver interactive content that will induce engagement. Host and be a part of Twitter chats, be consistent with your tweets, offer your followers value, network with influencers, and most importantly, interact and engage with your audience. In order to build your community on Twitter, you need to have versatile content. Apart from textual tweets, this also includes videos, images, gifs, memes, infographics, and so on. Up to 80% of Twitter users watch videos on Twitter. What’s more, videos are up to 6 times more likely to be retweeted than textual tweets or images. That’s why you should leverage the power of videos and include them more in your content. You can do this by creating your own original videos to either provide fun to your followers or a how-to video that will help them with some problem you know they struggle with. You can also make a teaser video about an upcoming product, or show your followers how your products are created. Make sure that you include a call-to-action in your videos so that you remind your followers to retweet them. Infographics are another relatively “new” thing on social media that has made a boom when it comes to engagement. Firstly, they are 30 times more likely to be read than regular posts or articles. Secondly, they are liked and shared up to 3 times more than other content. And finally, infographics are fun to the majority of Twitter users, mostly because they are easy to read, usually colorful, and fun. Therefore, utilize the power of infographics and include them in your content to increase engagement and provide quality content to your audience. What About Twitter’s Other Rules? Twitter has a very strict policy when it comes to intellectual property. In case of someone using other trademark/brand’s logo or name to trick or mislead users, Twitter can take action and even suspend their account. If you use the name or the logo of other brand to make it look like your brand is affiliated to them and with that confuse your followers, Twitter reserves the right to take the necessary action to stop that behavior. In some cases after reviewing the report on trademark policy violations, Twitter may give the account holder a chance to change the content so it doesn’t violate the trademark policy. But not every reference to a brand or trademark is in violation of Twitter’s policy. For example, you can use the brand’s logo if you’re doing a commentary, review, parody, etc. When it comes to copyright infringements, Twitter will respond to every concise copyright violation notice that is submitted. Reports about unauthorized use of copyrighted photos or videos hosted on Twitter, or even links that contain some infringing materials are taken seriously by them. To send a notice of a copyright violation, you’ll need to go to Twitter’s Help Center and read the instructions. Every report is reviewed in the order that it was received and you’ll be notified when it’s submitted. Trends on Twitter are an amazing way to find what is popular right now and they are determined based on where your location is and what your interests are. From time to time Twitter may stop some content from trending. This can happen if that content is deliberately created to manipulate trends or if it violates some of the other rules Twitter has. When the content of a tweet contains adult references or contains profanity, Twitter reserves the right to prevent that content from trending. In some cases, if the content encourages hate on bases of gender, sexual orientation, race, ethnicity, religion, disability, and so on, Twitter can also prevent it from trending. This can happen to any content that violates the rules created by Twitter. Twitter doesn’t allow for users to use third-party advertising in video content. It prohibits displaying (submitting and posting) any video content that contains video ads from a third-party. This can include different ads, such as short commercial clips or graphics from sponsors. The only way to avoid this rule is to get prior consent from Twitter. Pretending to be another person, group or organization with the goal to deceive or mislead others is another rule that Twitter has. This action of impersonation will get you permanently suspended from Twitter, except in the cases if your Twitter account states on its profile that it is not affiliated to anyone with a similar name or the user shares the same name, but not other common features. Portraying another person is prohibited, but having a similar name or similar avatar is not automatically a violation of the policy. There are rules on Twitter for selling and squatting usernames. Selling and buying usernames is not allowed on this social network. When it comes to username squatting, Twitter also has a rule for this occurrence. Username squatting is intended to prevent brands from using usernames that are trademarked by them. To prevent this tricky tactic by some user, Twitter takes a look at a couple of factors to determine if it’s a case of username squatting. For example, Twitter takes into account if the accounts created are for the purpose of preventing others from using them, and takes a look at the number of accounts created. It also takes a look if those accounts are created for the purpose of selling them. Another factor is if the account uses third-party content with the goal of updating the account. If the account is inactive for more than 6 months, or if it doesn’t have a profile image and has no updates, Twitter may remove it. And in case of buying and selling usernames, your account may be permanently suspended. Twitter takes attempts at technical abuse and spam very seriously. In the attempt to provide a secure and stable experience, Twitter strictly prohibits actions that may lead you to access non-public areas, systems, networks etc. (with the exception of Twitter Bug Bounty program). It also doesn’t allow the use of scripts and automated apps to access or search content on Twitter. In some cases crawling may be permitted (in accordance with the robots.txt file), but scraping is forbidden. Those and other cases of technical abuse are detailed and can be found on Twitter’s Help Center portal. Phishing and malware are also strictly forbidden according to the rules of Twitter. Submitting a link or publishing content which goal is to damage other person’s device or browser is not allowed. This also includes attempts to compromise some person’s privacy, no matter the goal of that action. When it comes to spam, many social media networks have problems or difficulties to minimize spam or remove it completely. As for Twitter, in their rules they clearly state that using Twitter services with the goal of spamming is not allowed. Publishing bulk content that tries to disrupt or manipulate users experience so it can drive traffic or attention to unrelated products, services or account is something that Twitter is fighting against, especially if you consider the latest updates. To mark and remove spam, Twitter takes many factors into consideration. Those factors are: sending a large number of mentions and replies without being asked for, following numerous accounts in a short period of time, being blocked by many people in response to using spammy tactics, etc. If you have duplicate content, try to mislead users with affiliate links, or try to artificially inflate your accounts followers, likes, or retweets, that’s also considered a spammy behavior. Breaking the above-mentioned rules about spam, malware and phishing may get your account permanently suspended or in some cases locked for awhile. If the user creates a new account with the goal to replace the old suspended account, that can result in a new permanent suspension of their account. A thorough recap of the most important social media developments that dominated 2017 and are important moving into 2018. Basics of Twitter, who uses it most, and getting your profile verified.